Life on earth is renewed every time you live out Jesus's prayer that God's ways will be followed on earth. The work of God's Kingdom involves restoring what has been broken. This includes people, unjust systems, relationships, anything that has been separated from God and needs to be healed, reconciled, and set right. This is how heaven collides with earth—not following fiery destruction but in the power of restoring to life everything that God created. What you believe about God's plan for humanity and for his creation determines how you will invest your life. God calls all of us to this renewing work. 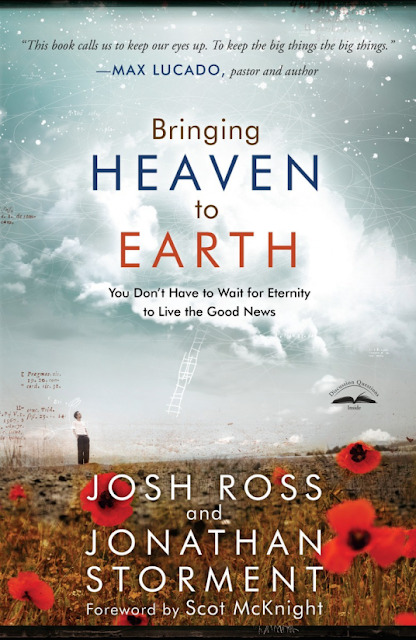 You can help bring heaven to earth, starting today. Bringing Heaven to Earth challenges the preconceived notions of heaven is away "out there" beyond the stars and encourages the reader to see the glimpses of heaven that are all around us, that the veil between heaven and earth is a thin one, evidenced by every day miracles such as birth, marriage and death. The authors also challenge the traditional Christian way of thinking that we are to be somber and hold to 'our own' - Jesus wasn't somber, he socialised with people - tax collectors, drunks, prostitutes ... sinners! One can hardly think that these gatherings of these 'social outcasts' would be quiet gatherings. Then there are the celebrations of heaven when one of us comes into a relationship with God - oh, what parties they are! You can hear the music and dancing ... hear DANCING!? Can you imagine the dancing that would be taking place, that enables one not merely to see it, but to HEAR it! This book is a challenging, yet easy, read. It will cause you to re-examine your beliefs and think about what has been taught in many churches as being 'so'. It reminded me that just because we are told something is 'so' doesn't mean that it has to be - there are other things that must be examined and taken into account as well.